Dinah Barkley: It's possible, you know, that Monsieur Barredout could see things in more that you don't appreciate. Josh Barkley: Listen, kid, now don't get any silly notions in your head. You're a song and dance girl. After being separated for ten years, Fred Astaire and Ginger Rogers reunited for one last film. The Barkleys of Broadway is a more dramatic musical than their earlier pairings, coming in the glory of Technicolor from Arthur Freed's impressive musical department at MGM. Perhaps back in 1949 seeing Astaire and Rogers in Technicolor would have been a dazzling new sight for audiences, but all these years later I rather prefer their humble black-and-white comedy to this mixed bag of drama. The two actors have aged since the 1930s and the story no longer follows the boy-meets-girl line of plotting. Josh and Dinah Barkley (Astaire and Rogers) are a married Broadway couple, racking up one hit musical comedy after another. However, while their careers are untouchable, the marriage is tearing apart at the seams. Josh's perfectionist direction diminished Dinah's independence, particularly in a devastating argument where he claims to have molded her out of clay. If you detect a bit of autobiography in this story, then you're correct. Astaire's notorious perfectionism never caused any serious problems with Rogers, though it certainly lends itself to this fictionalized tale. As the Barkleys embark upon their newest play, Dinah is approached by the suave playwright, Jacques Barredout (Jacques Francois), and Josh becomes enamored by Dinah's understudy, Shirlene (Gale Robbins). Only through the intervention of their composer, the cynical womanizer Ezra Millar (Oscar Levant), do the two keep from tearing each other's throats out. However, Ezra's efforts are in vain, for Jacques offers Dinah a role in his upcoming drama and Josh explodes. The two separate and the rest of the film is dedicated to reuniting them. The drama actually works quite well, with both Astaire and Rogers turning in convincing performances as the agitated stars. There are some impressive dance numbers, particularly the now famous They Can't Take That Away From Me and the comedic A Weekend in the Country. In fact, there's actually a fair amount of comedy, mostly provided by Levant's performance, that works well...on its own. The script, by Betty Comden and Adolph Green, never melds the comedy and drama together successfully. There are sharp, witty bits of dialogue and genuinely affecting scenes about the Barkleys, but they don't belong in the same movie. The success of the movie is in its visuals, with the rich colors on Technicolor can provide. The dances are up to Astaire's usual standard of success as he and director Charles Walters, working with Robert Alton (who directed the musical numbers), make a thoroughly dazzling aesthetic. The highlight of the craftsmanship is easily Shoes With Wings On, in which Astaire dances with multiple pairs of shoes that take on a life of their own. Thematically it makes absolutely no sense to have the shoes dance all by themselves, but it sure looks sweet and Astaire's grace makes it work. The problem with the movie is that it never decides whether it wants to be a pure drama with a few musical numbers, or a musical with a few dramatic scenes. The chemistry of Astaire and Rogers is still evident and works just as well as it did a decade earlier, but it's not enough to hide the misfire of the script. The Barkleys of Broadway is not a bad movie, but an anticlimactic resolution to one of America's greatest duos. Image Transfer Review: The 1.33:1 Technicolor image looks very good, with rich, vivid colors from start to finish. Skin tones are accurate, detail is strong, and depth helps to create a filmlike look. Some print defects, such as cigarette burns, are noticeable but are minor and forgivable. Audio Transfer Review: The English mono mix preserves the original theatrical experience, with the musical numbers sounding elegant. There's a slight hiss during the second half, though it never gets loud enough to be a distraction. There's also a French mono mix available. Vintage Short Annie Was a Wonder—the complete 1948 short film. Classic Droopy Cartoon Wags to Riches—the complete 1940 animated short. Extras Review: The special features swing into gear with the featurette Reunited: Astaire and Rogers Together Again (12m:35s). 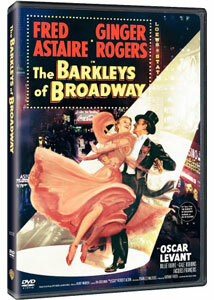 Containing interviews with Leonard Maltin, Astaire's daughter Ava, and many biographers, this gives the context in which the film was made. Additionally, a lot of information is conveyed about the original plan to have Judy Garland star opposite Astaire, but the real highlight is a collection of dance choreographers discussing the effect of Astaire's dancing on future generations. The featurette is brief, but gives a lot of information and is well worth a look. Following that is the 1948 short film Annie Was a Wonder (10m:50s). Depicting the life of a Swedish maid, the movie is a short drama/comedy who needs to decide whether she wants to go back to her homeland or stay in America and marry. The 1949 animated short Wags to Riches (07m:10s) is a Droopy the Dog movie. Droopy inherits a lot of money, but his fellow dog Spike tries to kill him and get the inheritance. It's just a collection of clever cartoon violence, but it is rather funny. Although not as classic as their earlier work, The Barkleys of Broadway does have some nice moments in it. The image and sound transfers present the original material quite nicely and the extras make this a nice inclusion in the Astaire & Rogers Collection: Vol. 1.